JERUSALEM (AP) — A Hamas rocket exploded Tuesday near Israel's main airport, prompting a ban on flights from the U.S. and many from Europe and Canada as aviation authorities responded to the shock of seeing a civilian jetliner shot down over Ukraine. Israel declared that Ben-Gurion Airport was safe and said there was no reason to "hand terror a prize" by halting flights. The rare flight ban came as Israel grappled with news that a soldier went missing after an attack in the Gaza Strip, raising the possibility he was abducted, a scenario that could complicate intense diplomatic efforts to end the two-week conflict. Palestinian militants have fired more than 2,000 rockets toward Israel since fighting began on July 8, but most — including several heading toward Tel Aviv — fell harmlessly into open areas or were shot out of the sky by the "Iron Dome" defense system, keeping Israeli casualties low. 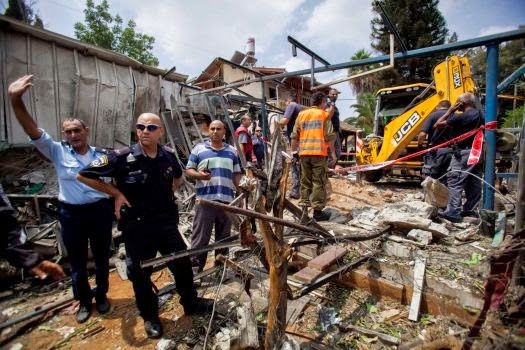 Tuesday's rocket attack was the closest to the airport so far, said police spokeswoman Luba Samri, and largely destroyed a house, slightly injuring one Israeli in the nearby Tel Aviv suburb of Yehud. Aviation authorities reacted swiftly. 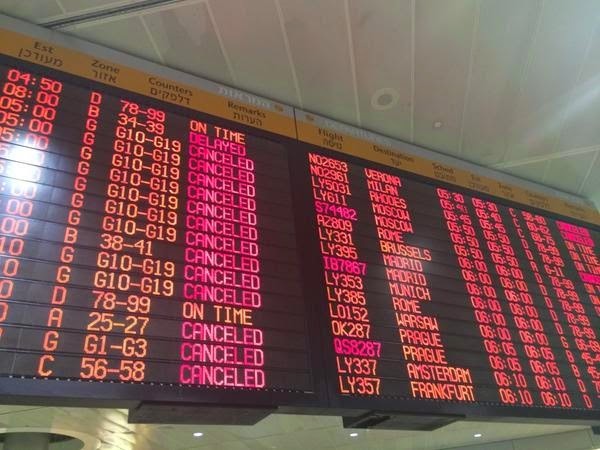 The U.S. Federal Aviation Administration prohibited American airlines from flying to Tel Aviv for 24 hours "due to the potentially hazardous situation created by the armed conflict in Israel and Gaza." Later, the European Aviation Safety Agency issued an advisory to airlines saying it "strongly recommends" airlines avoid the airport. Germany's Lufthansa, Air France, Air Canada, Alitalia, Dutch KLM, Britain's easyJet, Turkish Airlines and Greece's Aegean Airlines were among those carriers canceling flights to Tel Aviv over safety concerns amid the increasing violence.